Turkey saw Kurdish victories in northern Syria as a rallying point for autonomous Kurdish forces within Turkey. 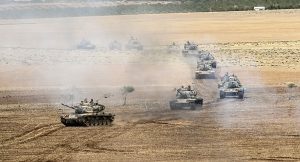 President Erdogan intervened militarily — sending tanks, warplanes and tens of thousands of troops into Syria, launching a war of extermination against the US-proxy Syrian Kurds! The Turkish invasion has advanced, taking Syrian territory, under the phony pretext of combating ‘ISIS’. In fact, Turkey has created a wide, colonial ‘safe zone’ to control the Kurds. The US quest for an imperial puppet regime in Syria has flopped: instead, Turkey gobbled up Syrian land, the Kurds resisted the Turks for national self-determination instead of driving out the Islamist mercenaries and Damascus faces an additional threat to its national sovereignty. One of the most striking aspects of US empire-building is the ease with which it has secured proxies in Latin America… and how quickly they are undermined! Imperial wars continue, but so does an upsurge in domestic instability, mass rejection of imperial policies, regional conflicts and national wars. The decline of the empire threatens to bring on an era of intra-proxy wars – multiple conflicts, which may or may not benefit the US empire. The war of the few against the many is becoming the war of the many against the many. But what are the choices in the face of such historic shifts? This article was posted on Saturday, September 10th, 2016 at 8:27pm and is filed under Central Ixachilan (America), China, Empire, Japan, Militarism, Philippines, South Ixachilan (America), Syria, Turkey, Viet Nam.